Nestled in the foothills of the Blue Ridge Mountains, this is the perfect vacation rental for families and friends, who want to connect with nature and enjoy the outdoors. The cabin property borders Michaux State Forest and is within walking distance to Strawberry Hill, a non-profit environmental education organization with a nature center open to the public. Please visit http://strawberryhill.org/ for more details. We offer year-round family programs and events, and it is surrounded by 10-mi of hiking trails meandering around a high quality cold water stream valley. This is 815 sq. ft. quiet modern cabin is accessed by ½ mile private lane. The cabin includes two bedrooms that sleep five (Please see photos) with an updated kitchen and porch deck. Open living and kitchen area (stocked with pots, pans, and utensils), full fridge, oven & range, coffee maker, microwave, toaster, full bath with shower (towels). One bedroom with queen bed, second bedroom with bunk bed (linens provided). Deck with dining area. Mudroom to store outdoor equipment w/ washer & dryer. Electric heat and air conditioning. Parking. Pets welcomed. The cabin is just a short 15 min. drive from the Gettysburg Battlefield, 10 min. from Liberty Mountain Ski & Golf Resort, and is adjacent to Michaux State Forest. If you love to hike, bike, hunt, fish, ski, enjoy wine and fruit country, golf, horseback ride, explore history at Gettysburg, or discover nature this is the place for you and your family. While you enjoy your stay, you can schedule your own private program with one of Strawberry Hill’s Naturalists who will guide you and share their knowledge of the area, including hiking, birding, stargazing, fly-fishing, tree identification, and more… and there are even private children’s activities that can be scheduled. By staying in this cabin, you will not only find the perfect place to relax, but you will be helping to support Strawberry Hill's mission of environmental education. Strawberry Hill protects the Swamp Creek Watershed and connects our community with the natural world through environmental education and land stewardship at our preserve in the South Mountain Region. We connect our community with the natural world by teaching, inspiring, and promoting stewardship of our environment. For more than 27 years, Strawberry Hill has interpreted our open space as a living classroom for people of all ages in our community. Strawberry Hill was founded in 1986 by Frances Morton Froelicher. Mrs. Froelicher began the foundation to support her husband’s, Hans Froelicher, efforts to clean-up and protect the Swamp Creek Watershed. In the early 1960′s, the Froelichers began purchasing properties in Hamiltonban Township, stitching together various tracts of land to create the original 519 acre core of Strawberry Hill. After her husband’s passing in 1976 and after ten years of failed efforts to find a new owner, which would commit to providing environmental education, Mrs. Froelicher created the foundation to establish an environmental education center at the Preserve. Mrs. Froelicher managed the land and worked towards establishing an environmental center until her death on December 31, 1994. In her passing, she gave Strawberry Hill to the community of Mount Hope, and provided a small endowment to create an environmental education center. Strawberry Hill has grown to 360 individuals and families from the surrounding community. And, Strawberry Hill’s academic programs enrich the lives of over 6,000 children annually. The Froelicher’s mission was to provide the community of Adams County with awareness, appreciation, and understanding of our natural environmental and cultural heritage through programs provided by the organization that now operates as Strawberry Hill. Strawberry Hill strives to maintain the health of the Swamp Creek and Middle Creek Watersheds, two high quality cold water streams. The main focus of our conservation plan is habitat restoration and protection in order to promote the biodiversity of native plants and animals. Today, the Preserve protects numerous wetlands, vernal pools, and two high quality stream corridors, and the cultural heritage of Swamp Creek, Middle Creek, and Mount Hope. The Preserve provides recreational opportunities to Adams County residents through a variety of cultural and environmental programs and by maintaining ten miles of trails that are open to the public for hiking. By choosing to stay here, not only do you find a gem of a cabin, prefect for a relaxing vacation, but you also help support the mission of Strawberry Hill and continue a legacy set forth by the Froelichers over 50 years ago. Proceeds from the rental of this cabin go to support our environmental education programming for children and adults within the surrounding areas. Located in the S. Mountain foothills of Central PA and adjacent to Michaux State Forest, this cabin is built on a charcoal hearth and has access to over 10 miles of hiking trails. We ask that you only do small loads when necessary to help conserve water. Water conservation is extremely important to us. We ask that you help to conserve water while staying in our cabin by following some of the recommended conservation methods listed in the cabin. Please be aware that there is no telephone located in the cabin and cell phone reception is very limited. Please check your phone for wi-fi capability to make calls. Spent two days at charcoal cabin with 3 girlfriends to hike a stretch of the Appalachian trail. It was the perfect size to visit with all necessities already there! Clean, quiet, and remote with access to other hiking trails adjoining the property. The bunk beds were a bit challenging and more in keeping with a child or teen than an adult. Reconfiguring the bed layout would be a plus! The cabin was just enough and made for a pleasant stay. Perfect ski getaway! This remote cabin has everything you need. And, it sits at the start of beautiful hiking trails. We will definitely stay here again! The cabin was great. So remote and peaceful even the dogs loved it. Was too cold to sit on the porch but still enjoyable. We went for a long hike but it was so muddy we couldn't go far. We plan on returning in late summer. The cabin was a much needed, peaceful getaway. We would love to visit again in the future. Was exactly what we were looking for! We’ll be back during the Summer! 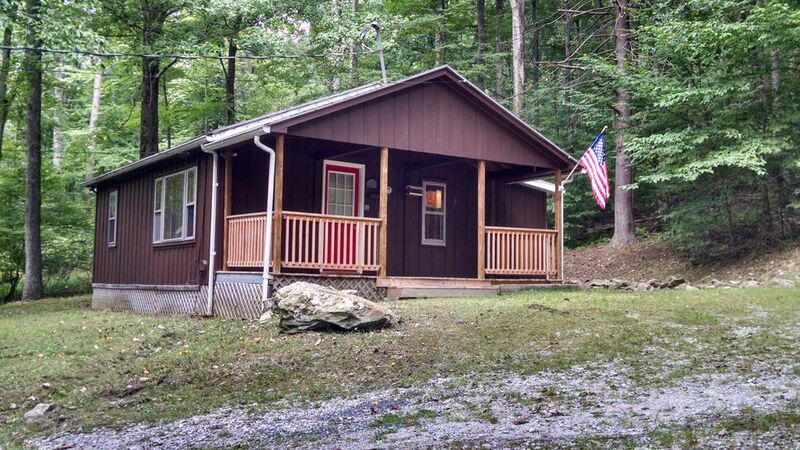 This cabin is nestled in the Swamp Creek valley, a high quality cold water stream in Adams County PA. Located at the end of a private lane, the cabin property borders Michaux State Forest and will connect you to 10-miles of trails that start right outside the door. Strawberry Hill Nature Preserve is a non-profit education and conservation organization, which protects 609-acres of a high quality cold water stream and provides environmental education. The preserve offers outstanding opportunities for you to discover and explore the natural world. The property contains diverse habitats, including wet and dry woodlands, three ponds, two mountain streams, and much more. The ten miles of trails meander throughout the property and lead to unique rock formations, scenic vistas, and secret glades. While you enjoy your stay, you can schedule your own private program with one of Strawberry Hill’s Naturalists who will guide you through the preserve and share their knowledge of hiking, birding, star gazing fly-fishing, tree id, and more… and there are even schedule private children’s activities for those parents looking for an opportunity to slip into historic Gettysburg. The cabin is just a short 15 min. drive from the Gettysburg Battlefield, 10 min. from Liberty Mountain Ski & Golf Resort, and is adjacent to Michaux State Forest. Gettysburg and Adams County offer year-round history and fun. You can tour the Gettysburg National Military Park on foot, horseback, or even a Segway. Experience the restored Cyclorama Painting. Walk in the steps of President Abraham Lincoln. Remember those who gave all in Gettysburg at the Soldiers' National Cemetery. Tour the homes and town of the citizens of 1863 Gettysburg. Gettysburg visitors will also enjoy theater productions, concerts, wineries, and nature trails. While in the area you can enjoy our orchards and charming small towns. Pack the golf clubs, you will be sure to enjoy the breathtaking and award-winning courses. The County is also known for a variety of unique shopping treasures! Fresh fruit & vegetable farms with roadside stores, Wineries, Antiques and Art shops, artifacts and books, clothing outlets, souvenirs, and more… there is plenty to do if you want to leave the woods. If you love to hike, bike, hunt, fish, ski, enjoy wine and fruit country, golf, horseback ride, explore history at Gettysburg, or discover nature this is the place for you and your family. By staying in this cabin, you will not only find the perfect place to relax, but you will be helping to support Strawberry Hill Nature Preserve. Proceeds from the rental of this cabin go to support our environmental education programming for children and adults within the surrounding areas.